You’ve heard of nCrunch, right? It’s a continuous integration plugin for Visual Studio that tracks changes to your code and then automatically builds and runs your unit tests in the background whilst you type. Once the results are back it decorates every line of code with a red or green light to indicate whether the tests are passing or failing. I have been using nCrunch for a while now and cannot recommend it enough. It has it’s faults – what doesn’t? – but all things considered it is probably the one add-on that I couldn’t live without. It speeds up the red/green/refactor cycle to such an extent that working without it feels like you’ve lost a limb. GruntJS (which I’ve been playing around with recently) can be setup to run QUnit tests using the headless PhantomJS browser and to feedback the results. In fact, this is all nicely packaged up in the grunt-contrib-qunit package for you, so it’s pretty simple to set up. Life is much easier when you don’t have to set stuff up yourself, so let’s use npm to get everything installed. Drop the following package.json file into the tests folder then open up a node command prompt in the same location. Run npm install and wait patiently until all the packages are installed. 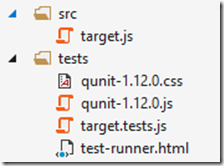 As soon as we save any change to a .js file our tests will automatically be run in the background. True, it isn’t nicely integrated into the IDE, and the level of feedback is very basic compared to nCrunch…but it’s a start!